Natural dye and weaving workshops, artist residencies and custom-made studio classes. 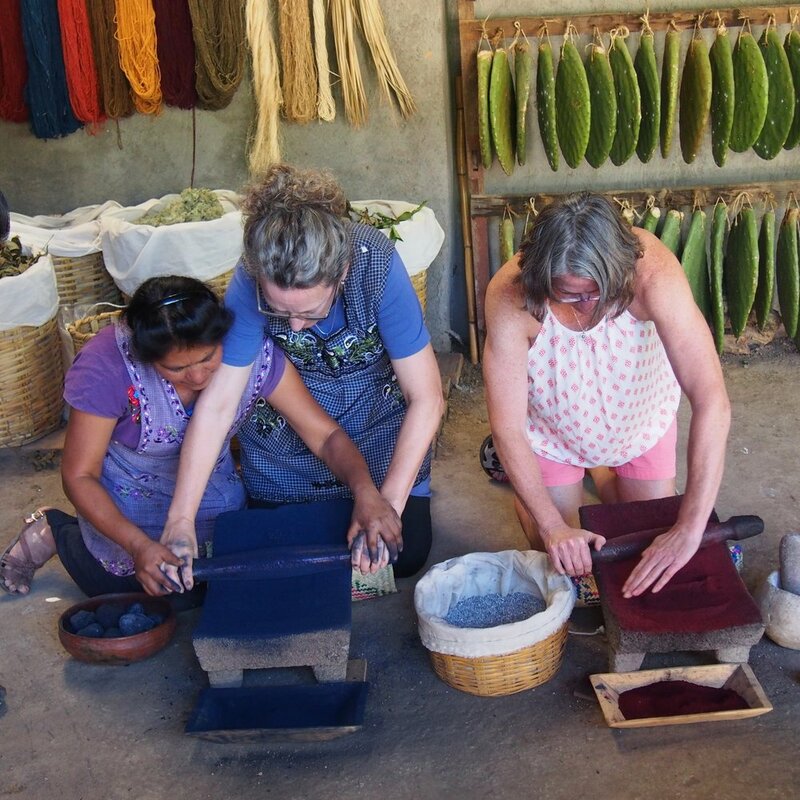 We've created workshops and studio experiences for guests to learn traditional Zapotec weaving and natural dye techniques from true masters of their craft. We invite students from absolute beginners to professional artists to join us for a unique immersive studio class tailored to your interests and experience. With our family as your teachers, you will learn time-honored techniques passed down to us from our ancestors. Sharing this knowledge with people who respect our traditions and customs is a great honor. With two comfortable guest rooms for you to stay in, you can relax and enjoy life in our home and studio. Our guests love being a part of the daily rhythms of life, sharing meals, learning to make their own tortillas or walking to the morning market for the freshest selection of locally grown food. Being a part of our family in this way brings a deeper connection to Zapotec life as it has evolved over the centuries. We remain close to our roots and invite you to experience our unique way of life alongside us. If you are interested in taking a workshop without lodging and food, please contact us for pricing. Explore traditional dyeing techniques, from identifying native plants to using mordants and overdyeing to achieve a range of natural colors from indigo, cochineal, pericon and more. This workshop is also offered for day students without meals and lodging for $680. Learn traditional Zapotec tapestry techniques from master weavers on our floor looms, creating your own 2'x3' rug over three days. This workshop is also offered for day students without meals and lodging for $680. Stay for a week and immerse yourself in our studio by first dyeing your yarns in a personalized palette and then weaving your own 2'x3' rug on the floor loom. Workshop runs from 9 AM - 4 PM daily with free time in the afternoons to stroll through the town or continue to work at your own pace. Prices for this immersive, creative week begin at $1600 per person. Additional days learning to cook or taking day trips to nearby villages and cultural heritage sites can be combined with your workshops. From our studio you can explore different textile traditions like backstrap weaving or embroidery with recognized master teachers. Customize your workshop to fit your interests by adding a class or extending your stay. Try a cooking class, make some day trips or explore the beauty of our natural environment while you're with us. We welcome inquiries from artists looking to stay longer and work independently, using the studio as their home away from home. Please contact us if you're interested in a special workshop or residencyall your own. All classes taught by master instructors from our family. Students arrive at 11 AM and usually finish by 2 PM. Ready to try your hand at indigo dyeing? This 3-hour class introduces you to the magic of indigo dyeing with your own scarf to dye and bring home with you. Class begins at 11 am and finishes by 2 pm. Maximum of 6 students. Group discounts available. The allure of cochineal is legendary. Discover how to extract rich red from nature and have your own scarf to take home as a lasting memory of your visit. Class begins at 11 am and finishes by 2 pm. Maximum of 6 students. Group discounts available. Our community includes master artisans who are experts in backstrap weaving, Oaxacan black and red clay pottery, embroidery and other traditional art forms. Please let us know what you'd like to explore while you're here and we'll make it happen!